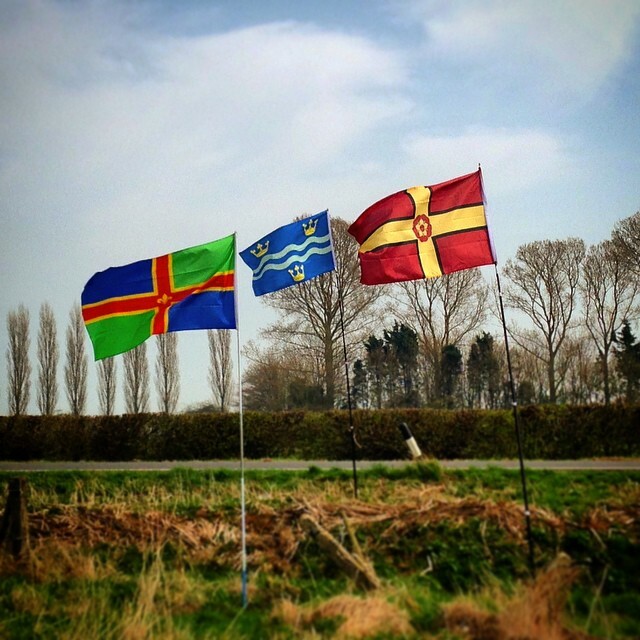 and registered on February 1st 2015, the day it was announced as the winning design in a competition held to select a flag for the county, which had been organised by adventurer and campaigner Andy Strangeway in conjunction with the Flag Institute. 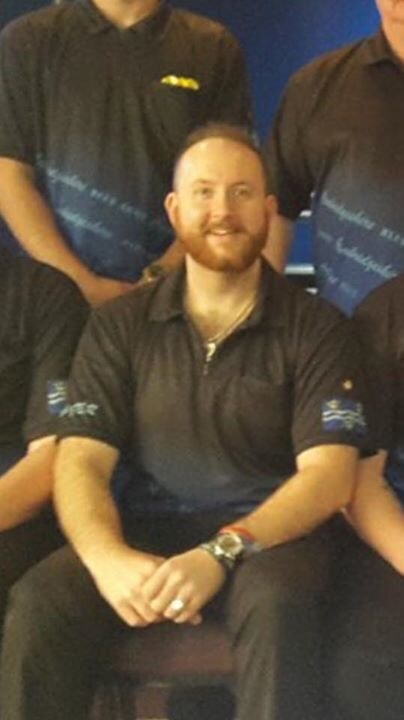 The competition ran in 2014 and was endorsed by several local authorities. This winning design was one of six finalists selected from the original submissions, by a selection panel that included local county councillors. 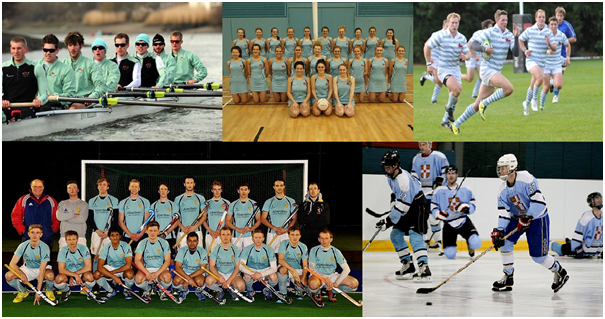 The wavy lines represent the River Cam and are in the colours of Cambridge University. Brady first conceived the design in 2010, originally using the gold colour of the crowns for the wavy lines of the river. Unlike other counties associated over the centuries with specific beasts or devices Cambridgeshire had borne no distinct, long associated, emblem. The insignia borne by the various administrative bodies that have existed in the county have been largely based on the royal arms of Scotland, as a result of the Scottish Crown’s tenure of the Earldom of Huntingdon and Cambridge during the twelfth and early thirteenth centuries. The original Cambridgeshire County Council, which shared administrative duties in the county’s territory, with an Isle of Ely council, bore arms that were newly created for it 1914.
was included in token of the royal Scottish connection as described. the body that administered the territory until 1837. These were red with three ducal coronets. 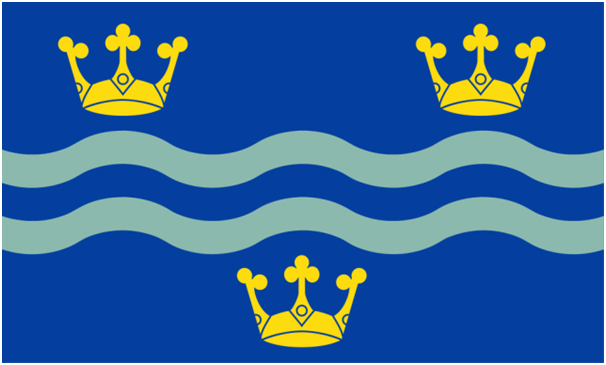 These crowns were retained in the Ely council’s arms, along with white and blue wavy lines, indicative of the abundant local waterways, found in this territory termed an “isle”. In 1965 these two administrations were merged and new arms were created by merging elements from its predecessors. 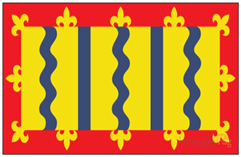 The wavy stripe became blue, which was a more logical colour for a representation of water and the three ducal crowns were placed along its length. However the background of the new shield looked even more Scottish as it was now made gold with the double tressure in red, as in the Scottish royal arms, shown above. Further reorganisation in 1974 led to the creation of yet another set of arms. This latest design was again based on the Scottish tressure, although this was now depicted in a rather novel realisation with a red border. Down the shield, wavy lines represented the many rivers of the county whilst straight ones (pallets) symbolised the drains and dykes that run through the Fenlands. These were all blue. Such representation of the county’s watercourses has been a persistent theme and one that was taken up again in several of the submissions to the county flag competition. The other two submissions referenced the county’s linkage with Cambridge University and the Fen tiger, a common theme in the county. 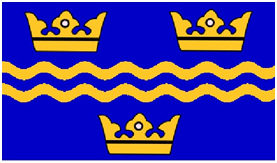 formed from the latest set of arms awarded to Cambridgeshire County Council, was commercially marketed as “Cambridgeshire flag”. 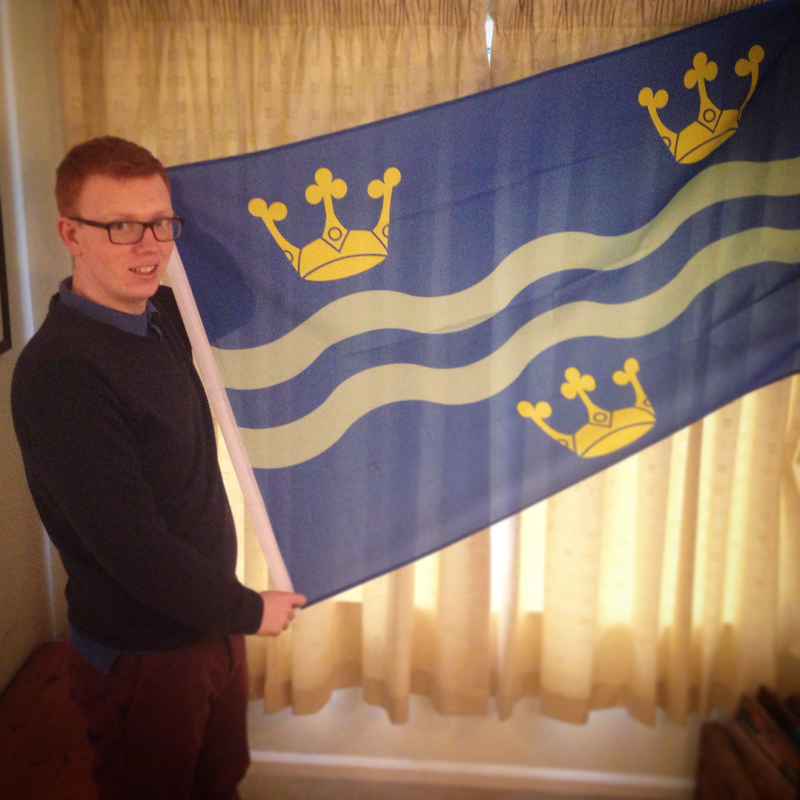 In fact this banner represents just the county council which is the only body that may use it. It has never represented the county as an entity. flies from the vessel “Lynn Union”, on the Great Ouse in Ely.